Jamie and Kemel fight but Kemel falls off a roof. He then saves Jamie's life from a booby trapped blade and a truce is formed between them as they go together to rescue Victoria. 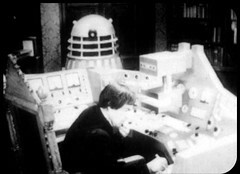 The Doctor and the Daleks confer on what is the human factor. Waterfield & Maxtible discover Toby's body: Maxtible is appalled and refuses to co-operate. Maxtible is about to shoot him when Arthur Terrall appears and offers to dispose of the body. Terrall catches Molly wandering the house and is furious at her: Ruth Maxtible, Terrall's fiancée, protects Molly but wants to know why Terrall is so changed. 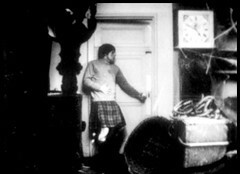 Ruth comes to speak with her father who tells her how the Daleks are going to give him the secret of alchemical transmutation to gold. Jamie & Kemel near where Victoria is hidden but are cornered by Daleks. A bit of an odd episode this week: lots of fighting and wandering through potentially trapped corridors, the sort of thing that probably works better with moving visuals. 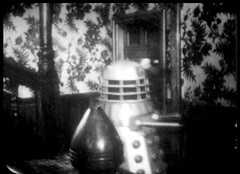 Troughton's off on holiday this week, his first break, so he appears only in brief pre filmed inserts observing the tests that Jamie & Kemel are enduring. Deborah Watling as Victoria is mostly absent too, in fact she's hardly appeared in any of the three episodes she's been in so far. 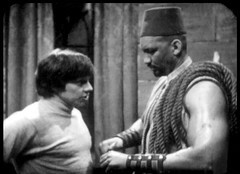 It's very much the Jamie McCrimmon action half hour this week! We do learn something interesting about Jamie this episode: He can read. He reads both Kemel's name and Victoria's initials. Given the time period Jamie is from I'd have thought literacy levels weren't that high. Is he well educated for the time or is the Tardis somehow giving him the ability to read? In fact it's interesting that Kemel himself, a mute Turk, can write English. I suspect Maxtible's description of him in the previous episode does Kemel a severe disservice! Jamie befriending the mute giant that everyone, save possibly Victoria, has previously looked down on is one of the highlights of this episode.